This election reflected a "crisis in confidence" brought about by inflation, unemployment, an energy crisis, and an eroding national image overseas. Reagan attacked Carter's leadership as the Iran hostage crisis dragged on. Carter warned that a nuclear arms race and national polarization would result from a Reagan presidency. Reagan asked voters if they were better off than they were four years earlier. The answer for many was "no." 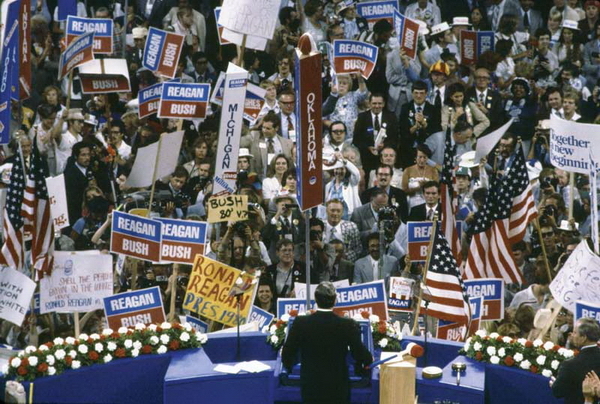 Ronald Reagan gives his acceptance speech at the Republican National Convention, Detroit, July 17, 1980. Courtesy of the Ronald Reagan Library.